From a Galaxy far far away, the Headchef Spaceman 4 Piece Sifter Grinder is from another world! 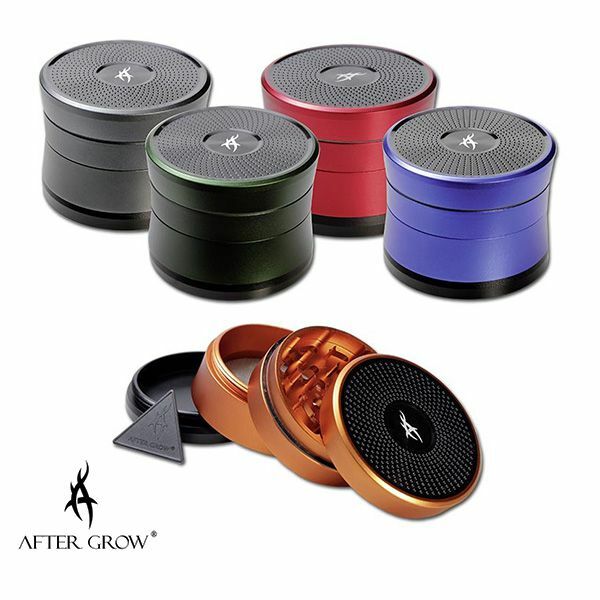 This ergonomically designed grinder features diamond shaped teeth to easily chop and grind even the toughest herbs, and the fine mesh on the lower compartment filters the finest and most potent parts of your herbs ready for when you need them. This lightweight grinder feels great in the hand and the smooth grinding system is seamless with no binding or screeching. 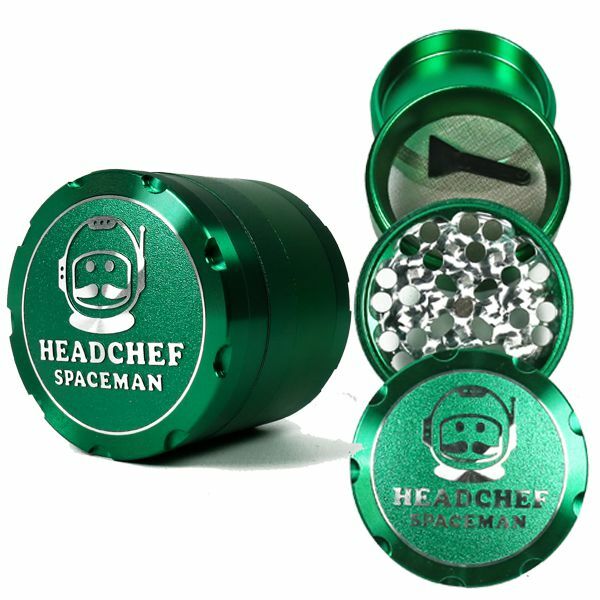 This premium grinder comes complete with the famous Headchef Spaceman logo and a branded luxury felt carry pouch, sifter scraper and presentation box. The Headchef Spaceman 4 Piece Sifter Grinder is available in five great colours including Alien Green, Black Hole Black, Plasma Yellow, Sun Flare Orange and Neutron Purple and are available now for just £29.99 each. Whether you are looking to grind your herbs, spices or tobacco mixtures, the Headchef Spaceman is perfect for the job and because of its aluminium construction is built to last a lifetime. With many things, the finished item is only as good as the preparation that is put into it before the end product is revealed, and this can be just as easily applied to preparing our herbs before using them in the kitchen, or enjoyment we get from smoking them. The grinder is the place to begin and the value of this should not be underestimated, After Grow are masters of their art, with them you know that you will be getting a great product, those that have managed to buy a Thorinder Sifter Grinder will happily endorse this. 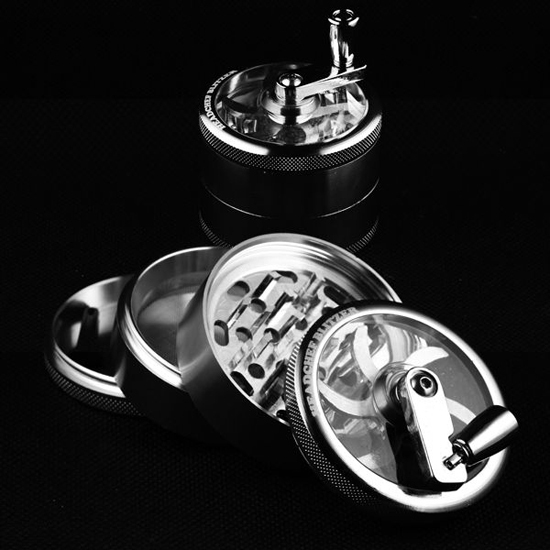 The Solinder is another winner from the makers of Thorinder, similarly made up of four parts, it comprises a two part grinder section, which has super sharp teeth to ensure a good clean cut, a sifter to make sure that the best and most potent part of the herb is sifted and collected in the bottom chamber. Renowned for quality, as well as being simplicity to use, you can be assured that the After Grow quality means that the Solinder Sifter Grinder product has been designed to be extremely durable, lasting for years. We are offering these to you in four colours, Grey, Blue, Orange, as well as Red, grab the one in your favourite colour and start grinding, these After Grow don’t hand around for long on the shelves, get one for your collection. This Rad grinder is guaranteed to give consistency every time thanks to the clear window which allows you to see your herbs being crushed exactly as you want them or just for the fun of watching them disappear into the net or main collection area. 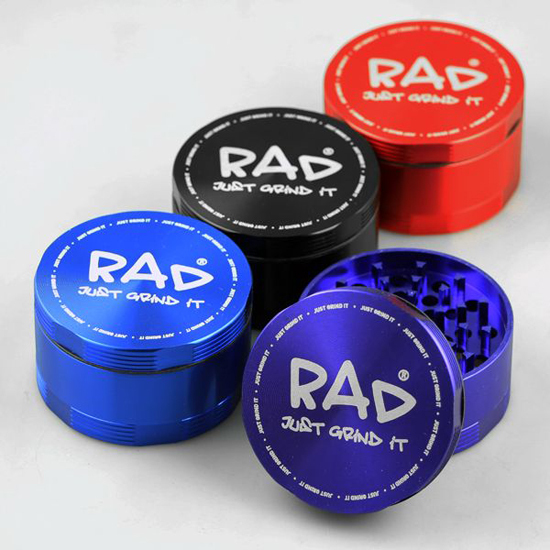 The Rad Just Grind It four part grinder has a neat sifter net which allows you to collect the most potent part of the herbs from the main herb collection area, which can be either stored in your stash pot or used immediately, allowing you get the very best from your herbs. With dimensions of approximately 48mm tall and 50mm in diameter, they are easily carried in a pocket or bag, the Rad is of the highest quality and is highly regarded both here and in the US. Currently we are offering the Rad in five colours, black, blue, purple, pink or silver. As any chef will tell you, grinding ingredients to the right consistency every time is vital if you are to reproduce recipes faithfully time after time, that also applies to amateur cooks and just as importantly smokers who need their favourite herb ground or shredded down to the preferred consistency. The Head Chef Speedy G Grinder will do that in the same way as many others, but there is a subtle difference, a clever hole has been included in the side to make pouring out the herbs simple. When not in use, the plug will keep the herbs in perfect condition ready for when they are needed. This is a great feature for the smoker, as they can just pour the ground herbs straight into the rolling paper, perfect when out and about. The Head Chef Speedy G Grinder features super sharp trapezium shaped teeth, this will ensure that the herbs and spices are ground or shredded to absolute perfection. So as many a chef, amateur of professional knows, a herb grinder is one of the most essential items to have, Head Chef grinders always get the seal of approval from anyone who has used them, many consider that they are the very best on offer. We offer the Head Chef Speedy G Grinder in five distinct colours, black, blue, purple, green or red, all at just £17.99, time to get cooking! 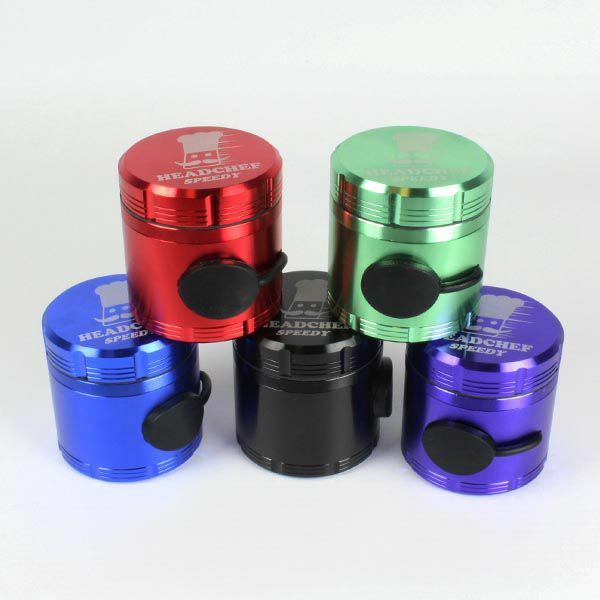 No more fiddling about with this four part grinder which is constructed from high quality anodized aluminium; this gives the grinder great strength as well as durability. As described the RAD is a four part grinder with the top two sections that are packed with sharp teeth to effortlessly tear up your herbs or spices. The third section is the clever piece which, unlike other grinders does not rely on the sifter being screwed on, it neatly incorporates a drop in design and the sifter is held in position by sandwiching it between the centre part and the base. The user can then easily inspect the sifter and look at any content still in the sifter as well as the base, it also means that it can be taken out and the grinder used without it if preferred. The 50mm size or an alternative size of 62 mm across enables a bumper load of herbs or spices to be loaded into it, without the need to keep adding more of the herbs. The two RAD sifter grinders are being offered by us in colours of blue, pink, silver, black, purple and red in the 50mm size, or black, blue, purple or red in the 62mm size. 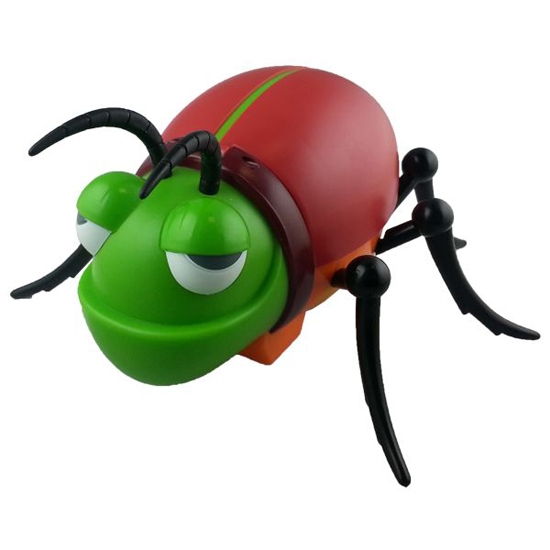 We can guarantee that this little bug will be the only one that you will be pleased to see crawling around your kitchen or living room. Even more so as it leaves behind a trail of finely ground herbs for you to scoop up and pop into a roll up, bong or vaporiser. Using it couldn’t be simpler, just open up the wing case and you will see a neat chamber for you to put in your herbs or spices. Simply close the wing case and watch as your little friend goes for a walk, but importantly he will leave a neat trail of fine herbs or spices behind him. Naturally you will want to put him on a surface which makes it easy to collect your herbs or spices, a nice clean and smooth surface we are sure he will like. If you are used to a traditional spice grinder, you will know that they do not always grind to perfection every time, Bud Bug has changed all that and ensures that he will give you giving a perfect grind to your herbs, flowers, bud and spices each and every time. Oh, by the way, keep him away from any other pets, they may become jealous! If you are looking for something that will grind your herb with the precision of the famed Samurai warriors, who of course were famous and renowned for their fearlessness and of course their super sharp swords, then you have found it with these super grinders which will shred your chosen herb with little effort. 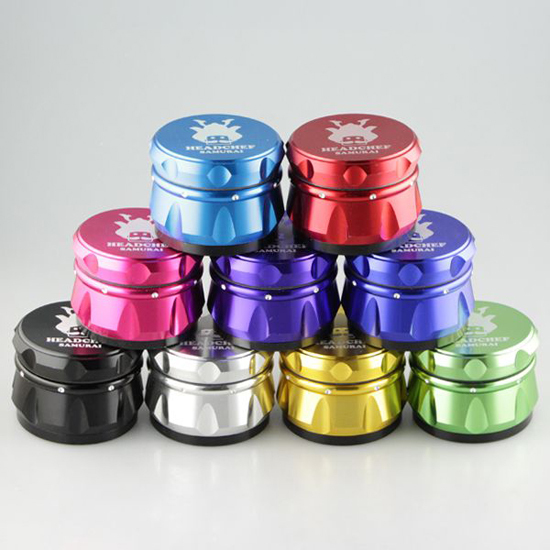 The 55mm grinders that we offer, features on the lid the new samurai style logo. In addition they have a brand new design easy grip design and we are offering them in a range of brilliant colours, you can choose from black, light or dark blue, gold, silver, green, pink, purple or red. The Head Chef Samurai Grinder is a 4 part sifter grinder that features a unique easy grip ergonomic design that makes grinding your herbs absolutely effortless, thanks to the set of very sharp teeth that will go through even the toughest of herbs with consummate ease. 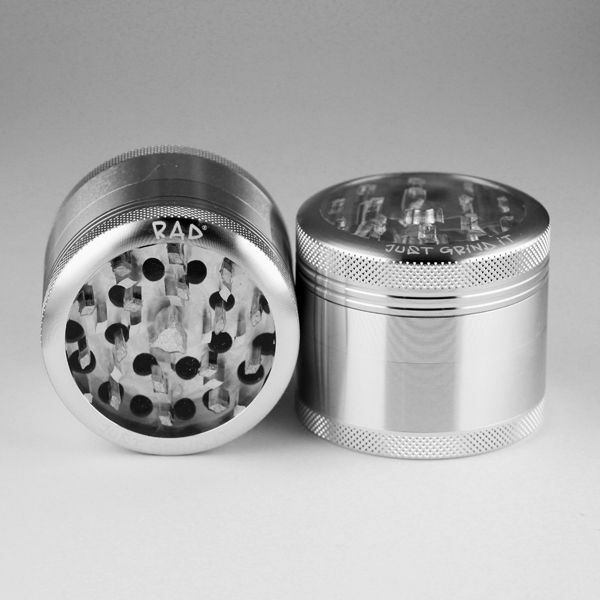 Featuring a centre section of the grinder that acts as a storage compartment that allows you to grind up a batch of herb and it is there ready for use when needed. When you want to capture the most potent part of your chosen herb, the sifter portion allows you to capture this, ready for use when needed. We have a wide range of grinders at our web pages and these include flat grinders, electric grinders, acrylic grinders, metal grinders, novelty grinders to bring a smile to your face, wood grinders, sifter grinders and a variety of specialist, branded products too, from the likes of Blitz / Spyral, Clearview, Head Chef, Space Case and Easyleaf, we also sell a choice of grinder cleaners to keep your product clean. Perhaps our top pick, if we were asked, would be the Head Chef Blitzer Grinder taken from a wide selection of head chef grinders and just in the same way as a top chef would not choose a set of knives of inferior quality, he would neither pick a cheap grinder for cutting and grinding important herbs that he is going to use for dish culinary delights. In exactly the same way he would from his set of knives the chef wants to be absolutely sure that the grinder will do the job it is asked to do each and every time. This is why the Head Chef Blitzer Grinder is the one that is chosen to make light work of even the toughest of herbs, time after time. Large in size this allows for larger batches of herbs to be ground to perfection and it also has the benefit of a clear top which will let the user see exactly what the consistency of the herbs, taking them out for use at the right moment. When not in use the handle folds away but it is the right size to get a good grip making it easy to grind even the toughest of herbs and spices. We include a scraper to ensure that all the ground herbs are collected from the sifter after they have been ground. The Head Chef Blitzer Grinder is built to last and with the magnetised and extra sharp teeth, perfect results are guaranteed every time.